If the end-user requires only the basic services of the Q-net queue management systems, Q-net Basic is the best solution. 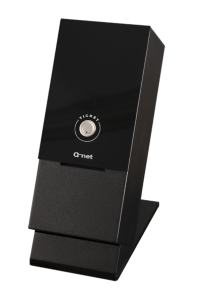 Its low-cost push button ticket dispenser is operating as the controlling center of the Q-net Basic queue management system and as a hardware periphery to dispense tickets. It can handle one task, that means every clerk is doing the same job. The time of arrival is recorded and this is the basis to call the next customer. TG13 is a desktop version, TG14 is the same unit on a stand. A 2-inch high-speed thermal printer is working in the ticket dispenser. All the necessary settings (time setting, flashing time of the displays, etc..) can be made with the help of the function buttons inside the ticket dispenser using a menu structure. The 2-inch high-speed thermal printer prints on the OA01 Thermal paper roll, details see there. This entry was posted in Basic, Basic Ticket Dispensers, Hardware, Queue Management Systems, Solutions, Start, Start Ticket Dispensers, Ticket Dispensers. Bookmark the permalink.